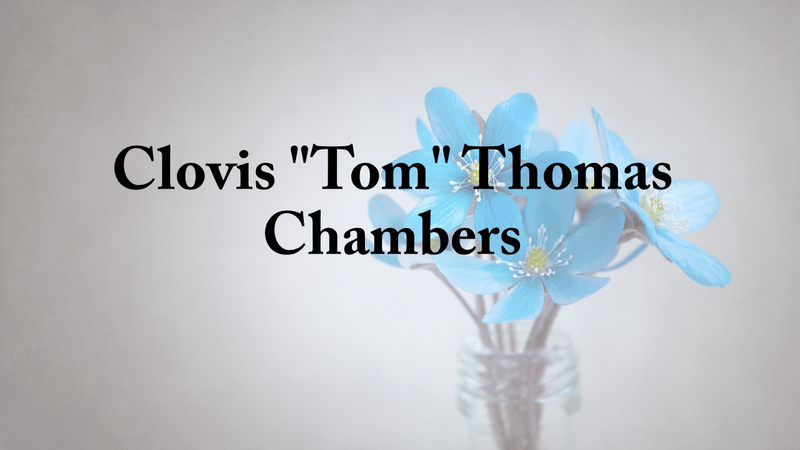 Clovis "Tom" Thomas Chambers, 87, of Haleyville, entered into rest on January 20, 2019 at his home surrounded by his loving family. Tom was born on August 20, 1931, in Haleyville, Alabama. He was affectionately known as "Tom Cat". Tom enjoyed fishing, shooting guns, working on cars and boats. Tom loved family get togethers. Visitation will be held on Tuesday, January 22, 2019 from 1 p.m. until 2 p.m. at Nichols Funeral Home in Haleyville, where services will be held at 2 p.m. Brother Greg Chappell and Brother Tommy Setliff will officiate. Burial will follow in Ireland Cemetery. Tom is survived by his wife of 64 years, Jennie "Tootsie" Chambers; sons, Tommy (Linda) Chambers, J.W. (Debbie) Chambers, Robert (Tiffany) Smith; daughters, Rosie (Tim) Jackson, Becky (Jackie) Hall, T.J. (Clayton) Scott, Bennetta Chambers (Kyle) Crowley; brothers, Floyd (Faye) Chambers; and sister, Vada Brown. He was "Paw Paw" to 9 grandchildren, Connie Batchelor, Brandie Jenkins, Angela Smith, Jacklyn Carruth, Sarah Scott, Haley Scott, Greg Myrick, Shane Myrick, Steven Myrick and 9 great grandchildren, Trent Brannon, Thomas Smith, Jocelyn Smith, Chloe Sanders, Jaelyn Kay, Ryleigh Carruth, Kendyl Carruth, AnnaLeigh Brannon, and Parker Brannon. He was preceded in death by his parents, Alfred and Nettie Chambers; brother, Lloyd Chambers; and sister, Carloyn Kirtpatrick.